At XDC 2016 there was a lot of interest in Joe Ranieri’s Compiler session where he talked about compilers and LLVM. I’ve already summarized a bit about LLVM in an earlier post, but after talking with Joe we decided to put together a series of blog posts on compilers. These will all be at a high-level. None of these posts are going to teach you how to write a compiler. The goal of these posts is for you to have a basic understanding of the components of a compiler and how they all work together to create a native app. A compiler is a complicated thing and consists of many components. In general the compiler is divided into two major parts: the front end and the back end. In turn, those two parts have their own components. Each of these steps processes things to get it a little further along for the next step to handle. The linker is not technically part of the compiler but is often considered part of the compile process. 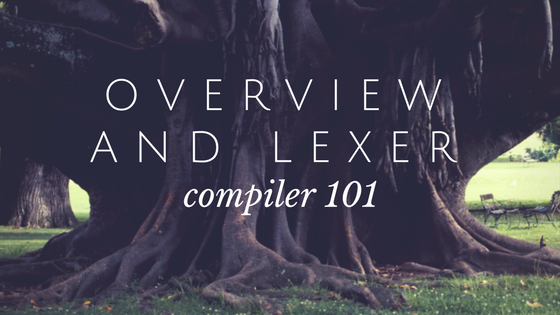 The lexer turns source code into a stream of tokens. This term is actually a shortened version of “lexical analysis”. A token is essentially a representation of each item in the code at a simple level. As you can see, white space and comments are ignored. So after processing that single line of code there are 7 tokens that are handed off to the next part of the compiler, which is the Parser. The Parser is covered in the next post. Stay tuned!